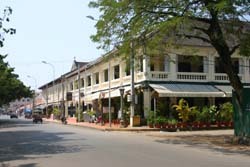 Beautiful downtown Siem Reap, near the old market. Siem Reap is the town closest to the ruins of Angkor Wat, although it's more than just a place to sleep and catch a plane. The city has developed into one of the most pleasant towns in Cambodia, if not Southeast Asia, with more than its fair share of good restaurants, although it has most recently started taking on some of the more unpleasant features of tourist hot spots. The tree-lined streets are bordered with restored colonial buildings housing cafes, pubs and bars where people gather to relax after a hard day of trudging around the temples. 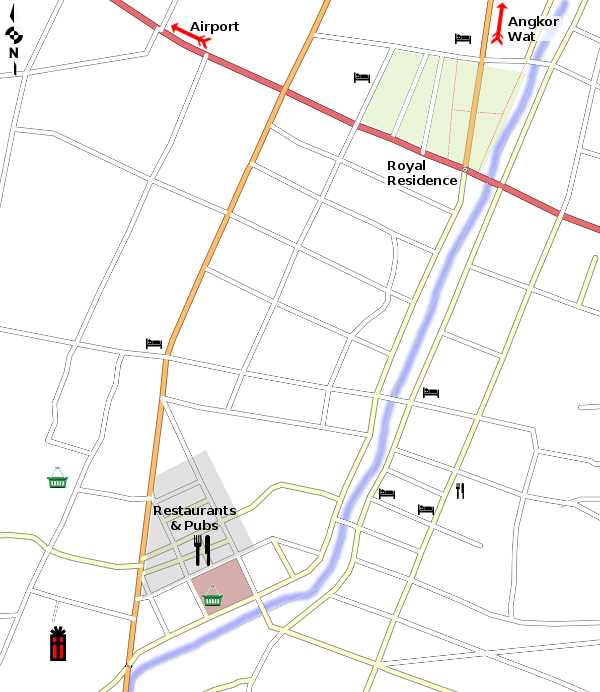 The dining and souvenir scene is focused on the streets around the old market at the south end of town. If you take a break from poking around the temples, then you can shop the old market, which is now mostly full of souvenir stalls. Around the market are a number of restaurants as well as several nicer shops selling better local handicrafts than you might find in the market. Click on any sight for more information.